This is a complete winter’s meal. It’s hearty and vegetarian, but if you want to include Italian sausage, cook it separately, slice it, and serve on top of the finished dish. 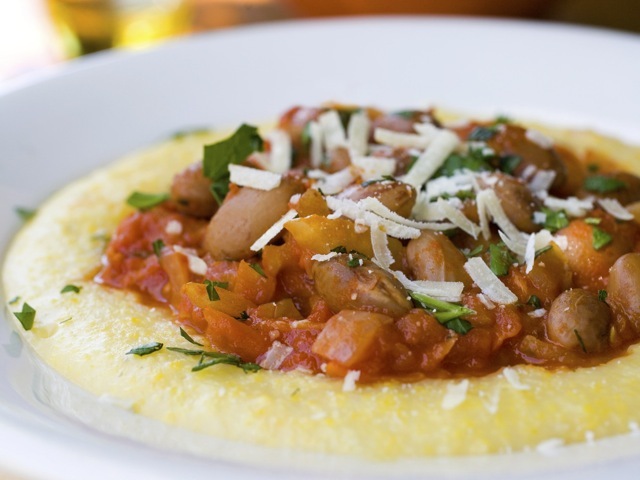 For a streamlined process, make the tomato sauce and the beans ahead and heat them together while you cook the polenta. Make the sauce: In a small Dutch oven or other heavy pot over medium heat, melt the butter. Add the onion, the fennel, the garlic, 2 teaspoons of the oregano, the red-pepper flakes, and a pinch of salt. Sauté until the vegetables are soft and fragrant, about 10 minutes. Add the carrot and sauté for 2 to 3 minutes. Add the tomatoes, stirring to break them up with a wooden spoon. Add another pinch of salt. Reduce the heat to low and cook, uncovered, at the barest simmer, stirring occasionally, until the tomatoes are reduced and beginning to separate from the oil, at least 2 hours or up to 3 hours. Add the remaining 2 teaspoons oregano and salt and pepper to taste. The sauce can be made up to this point 1 or 2 days ahead. Let cool and refrigerate. Make the polenta: About 45 minutes before serving, bring the water to a boil in a medium, heavy-bottomed saucepan. Add the salt and, whisking continuously, slowly pour the polenta into the water in a thin stream. Reduce the heat to low and cook, stirring nearly constantly with a long-handled wooden spoon, until the mixture thickens, the grains soften, and the polenta begins to pull away from the sides of the pan, 40 to 45 minutes. Stir in the butter and ½ cup of the Parmesan, and season with pepper. Cover to keep warm. This dish is best made with a rich, creamy bean. If borlotti are unavailable, try French horticulture, or wren’s egg, beans. Culinate editor's note: To cook dried beans, Sando and Barrington recommend the following: Put the beans into a large pot and cover with an inch of water. Let sit for two to six hours. If you wish, sauté an aromatic mirepoix of diced onion, carrot, celery, and garlic, and add this to the beans just before cooking them. When ready to cook the beans, add water to the pot so the beans are still covered by an inch of water. Bring to a boil and cook for five minutes, then reduce the heat to a gentle simmer. Cook for a few hours, until the beans are cooked. Add salt to taste; the authors suggest about 2 teaspoons salt per pound of dried beans.